A major partnership to help tackle dementia related house fires in South Yorkshire has won a top local health award. The South Yorkshire Dementia Action Alliances have worked with South Yorkshire Fire & Rescue to deliver the 'Dementia Fire and Home Safety Project'. The partners beat off competition from six other organizations to win the 'best organisation' gong at the Doncaster Dementia Awards, held at Doncaster College. Under the scheme, coordinators in each of South Yorkshire's four districts have promoted fire safety to a range of organisations working with people living with dementia and their carers, in a bid to reduce the risk of fire and the associated consequences. Part of the co-ordinators' role included promoting the fire service's home safety check service, whereby trained fire service staff visit people's homes and talk to them about preventing fires and other accidents and fit smoke alarms where needed. The project will also work with the fire service on a safety campaign specifically targeting those living with dementia and their carers, including a number of roadshows across the county. More than 15,000 people across South Yorkshire have been diagnosed with dementia - with thousands more thought to be undiagnosed. Dementia is known to be a major factor involved in accidental house fires and fire related injuries and deaths. Officers believe the project will benefit the fire service by providing a vital link with one of its key target groups in terms of vulnerability to fire. Area Manager Steve Helps, said: "In the last decade, the fire service has helped to make South Yorkshire safer than it has been at any time in its history in terms of house fires and fire related deaths and injuries. But we believe we can play a much wider role in terms of tackling some of the big health challenges our country faces in the future." "This project is the perfect illustration of that aspiration, where we use the coordinated efforts and expertise of those at the frontline of dementia care to improve the lives of one of the most vulnerable groups in society." South Yorkshire Fire & Rescue is also a member of the Yorkshire & Humber Dementia Alliance, which is committed to tackling the growing issue of dementia within our communities. Hundreds of its staff have also signed up to become Dementia Friends - a Government backed initiative which teaches people a little bit more about what it's like to live with dementia, and then turns that understanding into action. 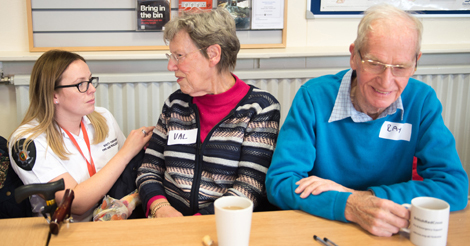 A monthly memory café at Adwick fire station in Doncaster also sees the fire service host support for people living with dementia and their carers. The fire service's Pete Jones was highly commended for his work in setting up the project at last year's Doncaster Dementia Awards. The South Yorkshire Dementia Action Alliances project was awarded funding under the Stronger Safer Communities Reserve, with money which had been set aside from the Authority's reserves. For more information on preventing fires visit www.syfire.gov.uk or click here to view a video produced by the project, which explains the links between dementia and fire.